BP and Italy’s Eni have reported a gas discovery off the coast of Egypt that holds 70 to 80 billion cubic meters of gas. The discovery in the Baltim South West area is jointly owned by both companies, Eni said in a press release on June 9. 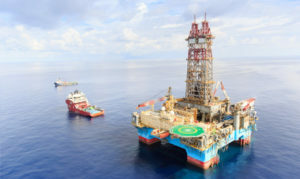 “Baltim South West discovery further confirms the significant potential of the so called ‘Great Nooros Area’, which is now estimated to hold 70-80 billion cubic meters of gas in place,” Eni’s statement said. “Our plan is to utilize existing infrastructure which will accelerate the development of the discovery, and expedite early production start-up,” Hesham Mekawi, regional president of BP North Africa, was quoted as saying by Reuters. The Baltim South West well is located 12 kilometers from the coast of Egypt. Egypt’s energy sector is still suffering from the 2011 Arab Spring uprising that led to a decrease in production and accumulation of debt to foreign oil firms. The unrest contributed to Egypt becoming a net importer of natural gas from a net exporter in the past few years amid rising consumption and falling production.